Bilder fra New York, Hamptons, Newport, Boston og Gloucester er lagt ut i galleriet. Royalwings arrived home on Saturday. We were greeted by our parents and brothers, who arranged a surprise party for us. We will spend the next week shining up the boat, and on Saturday it's homecoming party in Oslo:-) Thank you to all of you who have followed us on this journey. Luckily, we had a calm passage over the North Sea. Save for one day with 25-30 knots wind, we had very little wind and calm sea. It felt strange to sail along the coast of Norway, getting weather updates in Norwegian and chatting with people on Norwegian oil rigs and supply ships. You're never alone in the North Sea, we sailed slalom between oil rigs and production ships. Todays highlight: We heard rumours that Tom Nordlie will be the new coach for KIL (our local football team). Artikkelen om Royalwings som overlevde full storm i atlanterhavet var tredje meste leste artikkel i Seilas i August. We have enjoyed great hospitality and fantastic Haggis at the Grieve residence. And we got our asses kicked in rugby by Luke and Oscar!!! 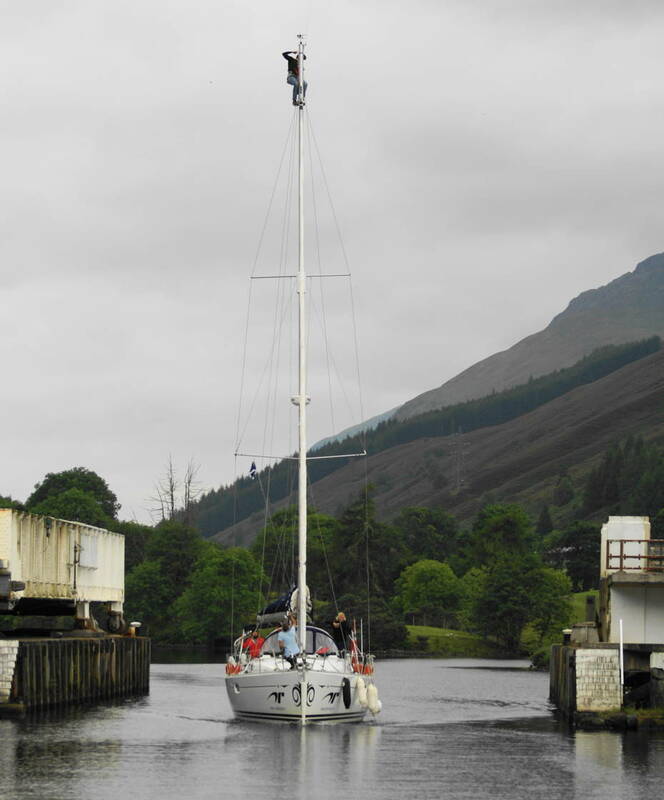 Today we are sailing to Fort William where we will pick up Marius (Kjetil's brother) who will join us for the trip through the Caledonian Canal. You can see our position while underway on the AIS webpage, click HERE. We arrived Isle fo Mull on Tuesday at around 18, just in time for Guy's homecoming party! Tomorrow we are invited home to Guy's place for roasted lamb, and we look forward to enjoy the local single malt in front of the fireplace. Royalwings er utstyr med en AIS-sender som sender posisjon og fart til nærliggende skip. Entusiaster i Irland og England har laget et kart som viser posisjon til skip som passerer. Royalwings sitt id-nummer (MMSI) er 257653890. NB: Senderen er slått av når Royalwings ligger til kai. Of course, it had to be the biggest festival of the year this weekend. Right here, in Dun Laoghaire, some 20 mins drive from Dublin city center... A modern suburb with just as modern marina, although the original breakers were erected as early as in 1805. And a very active and traditional sailing center too, housing the National Yacht Club, the Royal Yacht Club and St George Yacht Club, all established around 1850's and still located in the same beuatiful buildings. Yesterday we greeted the Green Dragon, Ireland's participant in the Volvo Ocean Race. But now we have a good weather window and will leave on Monday around 0500 for Isle of Mull, Scotland. Dublin is fantastic! 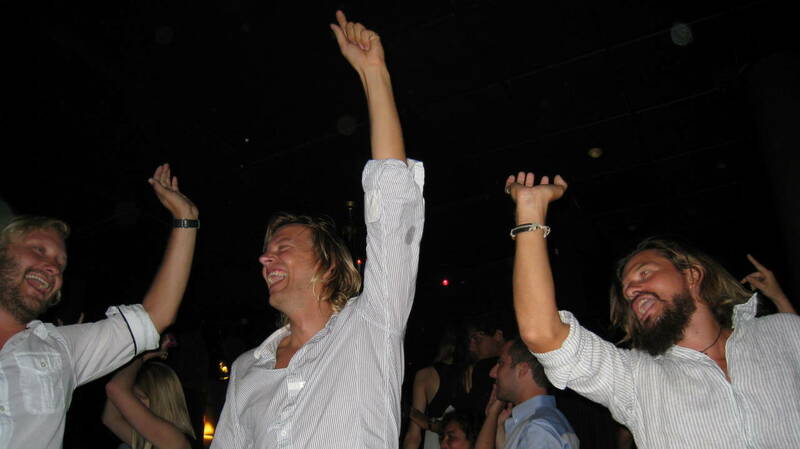 We're a little bit tired of being called the Bee Gees or ABBA all the time, even Nickelback!!! And posing for photos... But hey, that's rock'n roll right? We've had a wonderful and relaxing time in beautiful Crosshaven. We have spent most of the time inside Cronin's Pub, where we have received much care:-) Now we set sail for Dublin, where we stay 1-2 days waiting for yet another depression to pass by, before we head to Isle of Mull in Scottland. While we are waiting for the depression to pass by, there's a bit of maintenance to do on the boat. Both sails are pretty worn and in some places damaged due to one year in the Caribbean sun and rough sailing lately, so we have delivered them to a sailmaker for repairs. He will also make a third reef in the mainsail and a leechline for the second reef (which was lacking!). And the tank on the aft toilet is blocked, so we have a dirty job waiting for us... The solar panels needs cleaning of rust, the metal must be polished, etc etc. But all in all the boat is in surprisingly good shape after one year intensive use, and we are sooo glad we bought a new boat! Royalwings has arrived Crosshaven, Irland, where we seek shelter from another huge depression hitting the west coast of Ireland. We made it! Lørdag 1600 UTC. Posisjon 51 07'N 10 45'W. Now the sea has calmed and we are surfing at 7.5kn under blue sky. Royalwings går trolig til Crookhaven, Irland. Lørdag 1300 UTC. Posisjon: 50 59'N 11 23'W. Gjør 5 knop. Går muligens til Crookhaven i Irland. Følg reisen på kartet. Seiler 7 knop på en flik av forseilet. 14/08 1200UTC POS 49 09N 20 11W: SUN IS SHINING AND WE ARE DRYING UP. MOTORING FAST TO GET QUICKLY TO IRELAND. LOOK FORWARD TO FEEL LAND! 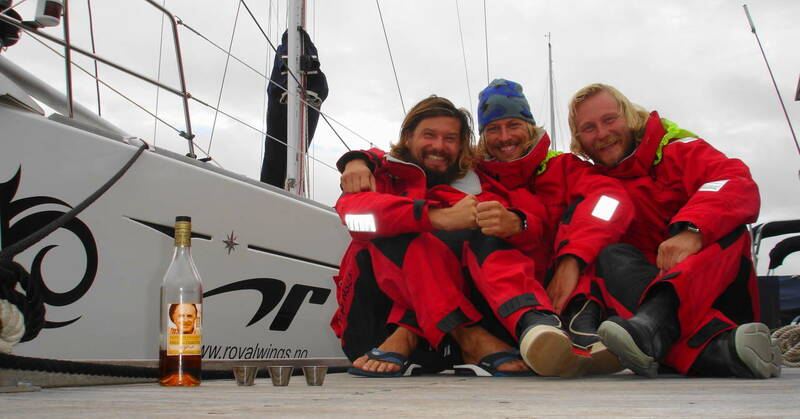 S/Y Royalwings er utstyr med AIS sender og mottaker som gjør det mulig for andre å spore deres posisjon, fart og kurs. Denne informasjonen er også tilgjengelig på nettet og nedenfor finner du en link til en side som viser live AIS-data for Irland og Storbrittania. POS 48N 27W 12/08 1200 UTC: NAA HAR BOLGENE ROET SEG OG VI SEILER MED FULLE SEIL IGJEN RETT VEST OG HAAPER VI SER LAND FOR NESTE LAVTRYKK. 13/08 1200UTC POS 48 38N 23 26W: PERFECT DOWNWIND, CRUISING AT 7-8KN. AIM FOR SOUTH IRLAND ON SUNDAY. 10/08 1000UTC POS 48.01N 29.59W RIR AV ETTER DOENNINGENE ETTER LAVTRYKKET FORAN OSS MED KUN ET FRIMERKE AV ET SEIL, MEN I RIKIG RETNING! 10/10/2008 1000 UTC Posisjon 48 25'N 31 17' W. Roligere vær. Lavtrykket passer forrut. Kurs settes rett øst for å unngå lavtrykk fra Karibia som er ventet søndag. Går sakte østover i påvente av at lavtrykket skal passere foran. Vil gå for fullt østover fra mandag kl 1200 utc. 10/08 1200UTC POS 48.25N 30.58W SEILER SAKTE NAA, MEN KL 24 HAAPER VI AT ET UOENSKET LAVTRYKK PASSER OG VI GIR FULL GASS HJEMOVER, IGJEN..
Lørdag 9 august 1200 UTC. Posisjon 49 51' N 32 50' W.
Høy sjø i natt. Betydlig roligere i dag. Gutta er ved godt mot. Lavtrykket har nå passert, men et nytt er på vei. Kurs endres noe sørover til ca 48N for å unngå det. Reiseruten endres trolig til den engelske kanal. 07/08 1200UTC POS 51 12N 36 32W: A NIGHT WITHOUT WIND BUT BIG SEA. LIKE RIDING A ROLLERCOASTER ALL NIGHT. NOW ITS BLUE SKIES ABOVE US AND 20KN WIND. GOOD SAILING. 1002MB AND APPEAR TO BE THE CENTRE OF THE DEPPRESSION. EXPECT A BUMPY RIDE LATER. 06/08 1200UTC POS 50 34N 38 10W: ROUGH NIGHT AND EVEN ROUGHER TODAY. 30KN HEAD ON.HIGH SEA,BREAKING WAVES.CANT CONTINUE NE,GOING SOUTH. 1500UTC WIND DECREASE A BIT AND THINGS LOOK BETTER. FORECAST 40KN TOMORROW... WE TURN NORTHEAST AGAIN AND TRY TO GET SOME REST. En ny side med værmeldinger er lagt ut spesielt for atlanterhavskrysset. Siden finner du ved å klikke på Weather i menyen. 02/08 1200UTC POS 47 44.5N 50 22.5W: DOING 7KN ON 15KN NORTHEAST WIND. We set sail to cross the Atlantic! We must leave this place; there are too many bars here, and today the biggest festival of the year kicks off. From there we will sail the Caledonial Canal through the highlands of Scotland, and sailing with Nessie at Loch Ness, to the other side of Scotland and then directly to our home port in Sweden. PS: It's always nice hearing from you on our sat tel while underway (see how to send messages on the right column). Royalwings er fremme i St. Johns, Newfoundland. 28/07 1200UTC POS 47 03.2N 52 45.8W: SAILING ALONG THE COAST OF NEWF. ALMOST SUNNY(!) AND WE ARE HUNTING WHALES! 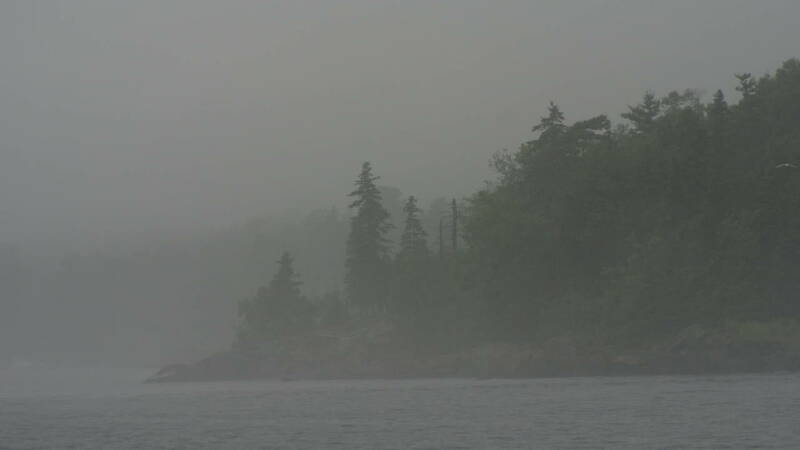 27/07 12.00UTC POS 46 03.9N 54 58.5W: FOG AND RAIN. BUT SAILING WELL. The storm Cristobal has passed and we set sail to Newfoundland, where we will have a short pitstop before the Atlantic crossing. 20.07 kl 12 POS 43 30.6N 64 57.8W: TETT TAAKE OG NULL SIKT. VANNTEMP DROPPET FRA 18 TIL 3 GRADER! TO STORE HAIER PASSERTE INNTIL BAATEN OG BESOEK AV DELFINER, SAA DE TRIVES VEL I KULDEN. MOTTATT MELDING PAA NAVTEX AT STORMEN CRISTOBAL KOMMER TIL HALIFAX PAA TIRS. VI ANKOMMER PAA MAN. PUUH! 19.07 KL 12.00 POS: 42 37.1N 67 09.7W: NATT MED MASSE LYN OG SQUALLS. SAA EN STOR HAIFINNE! LITE VIND. 18.07 POS KL 12.00 41 26.1N 69 43.8W: UTE AV NANTUCKET SOUND OG KURS MOT HALIFAX. FINT VAER MEN LITE VIND. Our new plotter is installed, everything works fine and we set sail for Hailifax, Nova Scotia in Canada, where we will have a short pitstop before the Atlantic crossing. But don't be surprised if we have to return to Newport again... After all, it's Groundhog Day! And we're back in Newport. What a bombshell! We were heading for Halifax, Nova Scotia in Canada, when the navigation instruments broke down again. For the third time!!! It is as if somebody just doesn't want us to ever leave this place... The good news is that Raymarine has decided to give us a new plotter. The plan is to sail to Halifax tomorrow evening. Today we set sail and cross the Atlantic to Falmouth, England. The latest update on Bertha is that she is degraded to a strong storm (sustained windspeed of 60 knots) but is expected to become a hurricane again during the next 24 hours. She is already the longest lasting hurricane ever reported in July. She is headed northeast (click on "Lenker" for link to the National Hurricane Center, who monitors hurricane Bertha). 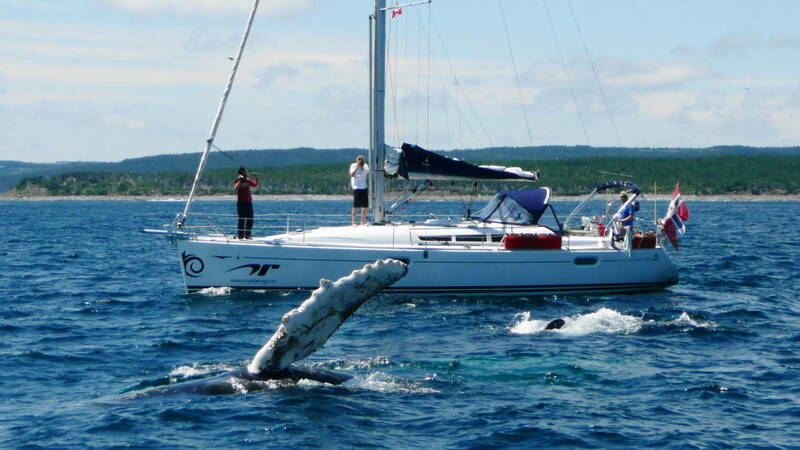 To be on the safe side, we will probably sail along the coast up to Nova Scotia and the great circle route from there. It is not reported any ice south of 50 degrees north. We will monitor the weather daily and if necessary make landfall in Canada. Her kommer det dere alle har ventet på! Masse nye bilder. Fra Aves de Barlavento, dykking og kiting på Bonaire, Aruba, seilasen til Jamaica med Frank, Bahamas, seilasen til New York med Per og ikke minst; innseilingen til New York oppover Hudson river!!! Så vi blir mest sannsynlig i Newport noen dager til for å se utvikliingen på Bertha før vi kaster loss. Vi ønsker ikke å seile rett inn i en orkan! Vi har naa vaert en ny tur i Merrimack, bare 25 mil unna - EN VEI - for aa faa en ny overhaling av vaare elektroniske produkter! Benytter anledningen til aa faa opplaering paa RayTech programvare! Skulle bare mangle etter totalt 10 timer i bil paa to dager... Regner naa med aa maatte vente noen dager paa orkanen Bertha, men seiler saa snart det aapner seg et lite vindu! Tilbake til bilen naa for aa kjoere tilbake til Newport... Jammen bra de har Food Exits paa Highway'n!!! Alt utstyr skal naa fungere....tror vi!!! P.S Og vi har fått litt ekstra utstyr som plaster på såret! Ja, TTT! Til nå har vi nytt gode dager i Boston mens vi har ventet på paraankeret vårt, men nå har vi ventet lenge nok! Siste leveranse kommer 2300 lokaltid i dag. Dette er vist ekspressleveranse... Men nå bygger det seg opp stormer, orkaner for å være presis! sør for Bermuda, som beveger seg nordover i retning rett mot vår rute. Så vi avventer utviklingen på "Bertha" som hun heter, før vi bestemmer oss for når vi eksakt drar opp ankeret og setter kurs østover. Vi har hatt noen herlige dager paa "Korsnes-Inn" i Newton, Boston. Etter denne behandlingen skulle vi alle ønske at Beldo-slekten var spredd til alle deler av verden - slik at at vi kunne ferdes fra gjestfrihet til gjestfrihet uten en eneste bekymring! Her har det vært delikat mat og myke senger, til og med bil har stått til vår disposisjon hver dag! Tusen takk Terje og Brigitte!!!! Det har også blitt noen dager hos Lars Henriks studievenninne som bor i Glouchester. Der var det feiring av St.Peter med løping på The Greasy Pole og besøk på baren som ble brukt i The Perfect Storm. De siste dagene har blitt brukt til bunkring av mat og drikke til overfarten. Kartplotteren er reparert og installert igjen og riggen er sjekket. Butan gass var umulig å oppdrive i USA og vi har derfor måttet bytte gass-system...noe vi ikke hadde regnet med! Men nå er alt på plass og vi mangler bare ferskmat. Vi forlater i kveld "Korsness-Inn" og drar tilbake til Newport for feiring av 4.juli før avreise rett over helgen! Håper på en kort stopp på Nantucket før den store overfarten. 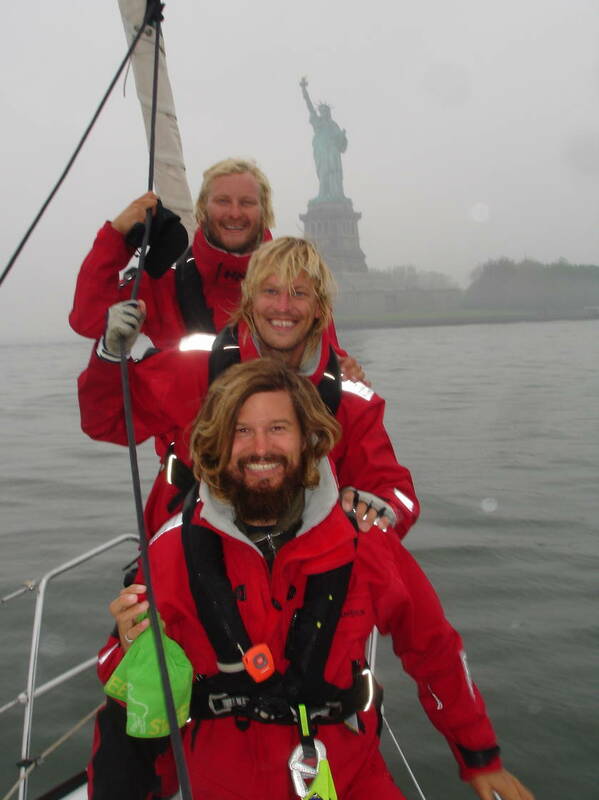 We arrived Newport early morning after a night of motoring without any wind at all, but with very thick fog... Luckily, we've got radar and AIS, cause the visibility was about 50 meter all night!!! Now the sun is shining and its really hot. Life is good! We have had a fantastic weekend in Sag Harbour and Montauk in Hamptons. Thank you Sean for showing us around and introducing us to all your friends here. The ride on the beach in your open jeep was like living the college dream, haha:-) Tonight we set sail for Newport and expect to arrive sometime tomorrow afternoon. We are leaving New York today and sailing to Hamptons, where we will be anchoring in Sag Harbour for a few days. Thank you to all of our new friends in New York for a fantastic time!!! Etter 950 nautiske mil non-stop seilas fra Bahamas, og 7 dager senere, ble Royalwings ønsket velkommen av Ms Liberty - selve symbolet på at drømmen virkelig har gått i oppfyllelse. Seilasen fortsatte videre oppover Hudson langs Manhattan med alle sine skyskraperne som bakgrunnsteppe. Helt fantastisk å komme hit i egen skute!!! Vi ligger nå i en marina på 79th street rett nedenfor Central Park. Nå hiver vi oss i dusjen før vi skal gjøre "the city that never sleeps"! P.S Per har "dessverre" ikke spydd, og har "dessverre" framstått som en utmerket skjømann. Mat kan han også lage, selv i stiv kuling! Stiv kuling, det er vel slikt vær selv ikke Ban Ki Moon har opplevd! 03.06 KL 15 POS 40 18.49N 73 47.48W: ANKRER SNART UTENFOR NEW JERSEY OG VENTER PAA AA SEILE FORBI STATUEN I SOLOPPGANGEN I MORGEN. HERLIG! Gutta nærmer seg New York. Følg reisen på kartet! Det var vel egentlig tid for avreise i går, men tiden strekker ikke til.... Kanskje blir det i morgen tidlig eller dagen etter det! Det er ikke så viktig med tid i denne langtur seileverden.... Satser på å være i NY innen den 5.juni. Det vil bli en utfordring for crew og innleid mannskap, men tøffe karer takler det meste!!! Vi sender sit.rap underveis og er som vanlig tilgjengelig på satelittlf etter avreise i morgen formiddag lokal tid!!! Da har Per kommet seg trygt ombord på Royalwings, velkomstpakken er overlevert og god mat er fortært. Den første kvelden ble avsluttet med cubanske cigarer på brygga og nattbad med rokker og annen fisk i 28,9 graders vann. I morgen gjør vi båten klar for et lenger seilas før vi tar en øl eller to på en av byens vannhull og satser på å sette kursen nordover på lørdag. Selv om vi nå har kommet oss på nett, så funker ikke våre mobiltelefoner på Bahamas. Vi ankom Nassau på Bahamas i går ettermiddag etter fire fantastiske dager til havs! Siste ankringspunkt ble midt ute på Grand Bahama Bank på 5 meters dyp over krystallklart vann og masse koraller...alt dette uten en øy eller annet tegn på liv innen synsrekkevidde!!! I morgen skal vi intervjues av USA's ambassade og forhåpentligvis får vi visum for å besøke New York på veien hjemover... Det er trist å være på vei hjemover...men også litt deilig... Blir her en ukes tid før vi får besøk av Per, en kompis av Andreas, for seilasen opp til NY. Vi seiler i paradis. Krystallklart grønt vann 5m dypt så langt øye kan se. Nyter sol og varme. Royalwings seiler fra Cuba. Følg reisen på kartet. Vi har hatt en opplevelsesrik og spennende uke i Havana og har naa leid bil og er paa roadtrip fra Havana til Santiago, dvs nesten hele Cuba paa tvers. Har overnattet i Cienfuego og Trinidad. Begge byene staar paa UNESCOs liste for World Heritage og det forstaar man godt naar man ser de fantastiske bygningene og gatene. Underveis bor vi privat i saakalte "Casa Particular", og faar servert deilig hummer til middag. Da smaker det godt med en Cohiba Siglo VI etterpaa:-) Joda, det er backpackerne sine det!!! Andreas har blitt frastjålet sin telefon. Abb. er derfor sperret men blir gjenåpnet når han får ny telefon. Vi kom trygt fram til Habana (som de kaller Havana) i mer eller mindre eget fly. Ble hentet fra flyet i en leddbuss, bare for oss, ble fraktet i til en terminal, bare for oss, 20 taxier som ventet, bare for oss, saa ja, vi fikk en eksklusiv tur hit. Dette kommer vi mer tilbake til senere. Naa har vi nettopp faat 3 timer privatundervisning fra en Cubansk professor i Cubansk historie, som ogsaa har viste oss en av de faa computerne her i byen. For her det ikke mange slike.. Dette er som aa komme tilbake til 50-tallet, et slitt 50 tall... Men gamlebyen er helt FANTASTISK!!! Flere vil ha tilgang til pc.en her, saa vi maa gaa. MEN vi lever og koser oss glugg ihjel! I dag flyr vi fra Santiago de Cuba til Havana. Nye bilder fra Los Roques er lagt til i galleriet. Etter et par fantastisk late dager på den lokale stranden, kom idag morges cruiseskipet Braemer fra Fred.Olsen inn til Port Antonio. Vi kom raskt i kontakt med den norske kapteinen Atle ombord. Det ble utveksling av erfaringer sjømenn i mellom og en rask omvisning i respektives skuter! Vi ble påspandert en øl på akterdekket og traff noen andre trivelige nordmenn som var svært fornøyd med Jamaica. Vi forsøkte å få hyre ombord bort til Montego Bay, men med liten suksess....dessverre for det hyggelige crewet til Kapt.Atle! For vi kan ikke annet å innrømme at det har vært fantastisk å sove 3 netter i king size senger med fjærer herfra til himmelen. Ahhh... Og aircondition! Men ikke for kaldt, bare nok til at det ikke er fuktig og klamt når en våkner av solen som steiker. Men nei, vi er menn på tur og her skal det lides. Fy så fælt vi har det... Og en takk til Presley&Co som har vasket og polert båten vår mens vi var oppdagelsesferd i storbyen, kost oss med god mat, godt drikke og skjemt oss bort så godt vi kunne. Nå vil jeg tilbake på båten og leve det enkle liv igjen. Seilerne har nå booket inn på hotell i New Kingston, og lever storbyferie. Jamaicerne meget hyggelige og gjestfrie mennesker, så vi har blitt kjent med mange av de lokale heltene. Da har vi gjennomført en full tur av "fylket" Portland (hvor vi ligger i Port Antonio), og er klare for Kingston på torsdag. Royalwings er på vei til Jamaica. Følg reisen på kartet. Bilder fra Isla Coche er lagt til i galleriet. Aruba er besteget og opplevd! I kveld setter vi seil mot Jamaica. Regner med en 4 dagers seilas silkeseilas hvis værgudene er med oss og vinden holder. Frank setter dermed en ny personlig rekord i non-stop seiling! På Jamaica venter forhåpentligvis avslappet og slapp rastastemning, for gutta er slitne etter all amerikansk innflytelse og jet-setliv på Aruba! Vi kan som vanlig kontaktes via satelittelefon. Vi har fått ny gjestebok, denne gangen med spamfilter og mulighet til å skrive laaaaaange innlegg, for sånne som er verbalt sterke og opptatt av ytringsfriheten, men ikke vet hva generalsekretæren i FN heter... Vi venter i spenning (les: frykt) på at skrivekrampen skal ta Harald. Vi ankom Aruba sent på ettermiddagen og ble møtt av 4 hyggelige tollere og narkohund som bokstavelig talt endevendte båten, men fant bare et imponerende lager av smågodis, noe hunden ikke syntes var særlig interessant. Men etter flere timer kontroll på tollhavnen, fikk vi endelig fortsette til Renesaince Marina. Og som gjest her kan vi bruke alle fasilitetene på Renesaince luksushotell. Så når Frank kommer i morgen kveld, blir det all inclusive - på'n igjen. Vi seiler videre til Aruba i kveld og forventer å være fremme i morgen ettermiddag. Litt synd å måtte reise nå, for det har vært utrolig bra her på Bonaire, med kitesurfing hver dag og dykking på flotte rev. Alle musklene er såre, selv den minste anstrengelse gjør vondt, og vi tygger Voltaren hele gjengen. På den annen side: I Florida er det Spring Break nå, og det skal visstnok merkes veldig godt på Aruba Men er Aruba klare for Royalwings? I dag har det ikke vært så mye vind, så eieren av kitespoten tok oss med på en wakebord tur som plaster på såret. Men det var ikke så lett, for vi måtte kjøre slalom mellom delfiner. Og sånn går nå dagene.... Og dette er INGEN aprilspøk!!! P.S Men vinden kom når solen var på tur ned, så det ble også litt kiting på "slutten" av dagen. Vi har midlertidig måtte stenge gjesteboken vår pga mye spam. Ny gjestebok med bra spamfilter er like rundt hjørnet. Og om en uke eller to er han også tobarnspappa. Imponert! Forlater Los Roques. Vi seiler vestover til Aves de Barlavento. Vi kom til Los Roques i gaar formiddag og moette Kari og Inger Lise paa kaien, som bare tripper etter aa spenne paa seg kitebrettet. Litt troebbel i innsjekk pga en feil i Margarita, men med en neve dollar og et stort, norsk smil ordner ting seg. Saa naa seiler vi til en liten sandbanke for aa kite. Problemene med bildegalleriet er nå fikset. Nye bilder fra karnevallet i Trinidad er nå lagt ut. Enjoy! Da er vi kun en hengelaas unna avreise. Vi skal ha den storste og feteste hengelaasen, for vi har ikke tid til aa miste en dinghy til... Saa kaster vi loss i ettermiddag (12.03.08). Etter en måned med hvile på Margarita (som trengtes - hardt liv dette her!!!) skal vi prøve å skrive litt også Så nå skal reisebrevene komme på løpende bånd (trur eg). Royalwings har fått ny hjemmeside! Den nye siden vil gjøre det langt enklere for gutta å legge inn innhold. Nytt galleri av den fancy typen er også på plass. Nå er det nok, nå greier vi ikke mer! Lars og Andreas har måtte ta et pust i bakken. Hardkjøret har tatt på! NÅ skulle vi få skille gutter fra menn, det blåste godt og bølgene slod rett i mot. De aller fleste bestod prøven, det var vel bare en "mann" som ikke bestod ilddåpen til havs. Godt seilt gutter!!! F...!!!! J... lokale svin! Dinghyen vår er stjålet. Skiensbanden kom smilende "hjem" fra PARADIS (Los Roques). Nå var det på tide å skille gutter fra menn og legge ut på en seiltur. Det ble en meget fin seilas til Coche, alle bestod prøven. For denne gang..
Skiensbanden ble veldig krevende, saa vi sendte dem med smaafly til Los Roques. De kommer tilbake paa torsdag, da skal vi gjore sjofolk av dem og seile til Isla Coche. Christian, lillebroren til Andreas, har vaert en uke paa besoek. Vi seilte bl a en tur til Blanquilla, en liten oy som bestaar av en kritthvit strand, 2 palmer og flotte korallrev aa snorkle paa. Royalwings er ankommet Isla Margarita (Venezuela) etter en veldig rask nattseilas fra Trinidad (laa stort sett over 9 knop), saa vi maatte bremse paa morgenkvisten for aa komme frem etter soloppgang. Carnival. En eksplosjon i farger, kostymer, rytmer, musikk, steelpans, soca, dans, rom&cola, smilende mennesker - og damene... de bryter jo alle fysiske lover med sin wining!!! Fest døgnet rundt til onsdag. Ubeskrivelig. Utenkelig. En fantasi. Landkjenning i Chaguaramas på Trinidad. På vei inn i havnen møtte vi 3 kjente båter...ingen vil misse dette! Allerede på immigration er damene i karnevalmodus. Satser på en liten sightseeing i Port of Spain i kveld før opplevelsene starter. Etter noen deilige dager på Grenada er det Karnevalstid og vi vender atter en gang snuten sørover...Mot Trinidad! Der venter ca 1 mill mennesker og verdens største fest! "One Dog" har kjørt oss rundt på Grenada. Som ekte indianere gikk vi barfott og i bare underbuksa inn i jungelen, opp på en høyde, og hoppet fra vannfall til vannfall, det høyeste på 12 meter!!! Føltes som å være i en film! Ankret opp utenfor Mustique etter nattseilas. Dette er playground for the rich and famous... og oss!!! Kjetil's nye nummer skulle fungere i hele Karibien, men Funket ikke på de Franske øyene. Franskmenn skal være så unike... Fra i morgen av er han på nett igjen etter 2 uker i mørket. Andreas er halvveis til pensjonsalder. Vi har plutselig en gammel mann om bord.... GRATULERER MED DAGEN! GODT NYTT ÅR! Ankommet Marin, Martinique. Ankret opp og leker oss i vannet før vi går inn til havnen. Lagt til kai i Rodney Bay, St. Lucia. Her skal vi feire nyttår. Ankret opp i Wallilabou, St. Vincent. Det var her The Pirates of the Caribbean (nr.1) ble spilt inn. 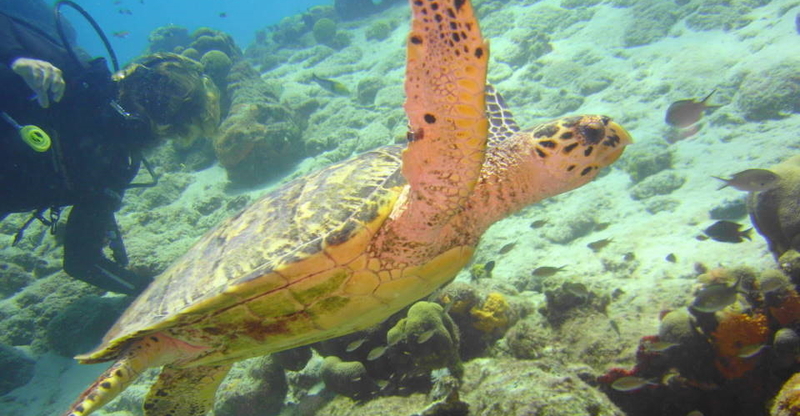 Forlot Tobago Cays i dag tidlig. Ankret opp utenfor Tobago Cays. FOR et krystallklart vann; DETTE er det vi har jaktet etter lenge nå. Se: EN SKILPADDE! Ankret opp utenfor Mayreau , leker i vannet mens pølsefesten gjøres klar. I kveld er det tidlig til køys for vi skal være de første inn i Tobago Cays i morgen! Etter en fantastisk julefeiring på Bequia seiler vi sydover til Tobago Cays. Satser på å ankre opp i et korallrev og snorkle litt i morgen. Ankret i et korallrev ved Blue Lagoon syd på St Vincent. Fått besøk av Trine og Fredrik og nå tester vi den lokale rom'en. Ankret opp i Wallilabou Bay på St Vincent, der filmen "Pirates of the Caribbean" ble spilt inn. Morgenbad i nisselue med "O helga natt" på full guffe lager julestemning. 20.12 KL 18 LIGGER FOR ANKER I RODNEY BAY PAA ST LUCIA ETTER EN FANTASTISK SEILAS. KJETIL LAGER FESTMIDDAG. VI HAR FAATT GJESTEBOK!!! God jul! 16.12 KL 14 POS 14 28N 60 52W. TRYGT FREMME I PORT DU MARIN,MARTINIQUE ETTER EN KORT STOPP PAA DOMINICA I GAAR. 16.12 KL 12 LOKAL TID. POS 61 35N 15 52W. AVREISE LES SAINTS TIL MARTINIQUE. 20KN VIND OG SEILER BRA. ETA MANDAG MORGEN. 13.12 KL 12 LOKAL TID. POS 61 35N 15 52W. FREMME PAA LES SAINTS. ESPEN DEBUTERTE MED STERK KULING OG ETTERDONNINGER ETTER STORMEN OLGA. Vi setter seil mot den lille øygruppen Les Saintes syd for Guadeloupe og regner med å være fremme i morgen formiddag. Nyter late dager på Antigua. Alle i baren får smake Aquavit og stemningen stiger. Reiser så snart gennakeren er fikset. 04.12 KL 1200UTC POS 16 59N 61 19W. LAND I SIKTE! FREMME OM CA 4 TIMER. 03.12 KL 1200UTC POS 17 01N 58 54W. I MORGEN BØR DIN DATTER IKKE VÆRE I ANTIGUA! 02.12 KL 1200UTC POS 16 52N 56 09W: SPEILBLANKT HAV,BLIKKSTILLE.GER FOR MOTOR,HAR DIESEL FOR 2 DXGN. FORVENTET ANKOMST ANTIGUA ONSDAG. 01.12 KL 12UTC LITE VIND OG FLATT HAV. LEI AV SOL OG VARME. LENGTER ETTER SLUDD OG SNX. YOU LUCKY BASTARDS! 29.11 KL 12.00 UTC POS 16 43N 50 09W. LEKT KATT OG MUS MED LYN OG TORDEN I HELE NATT. NE DRIVER VI MED STRXMMEN I VINDSTILLA. 28.11 KL 12.00 UTC POS 16 29N 48 16W. ET PAR MINDRE SQUALLS I NATT MED KRAFTIG REGN OG VIND. LITE VIND I DAG.ER BLITT VIRKELIG LATE. 27.11 KL 12.00 UTC POS 16 06N 46 07W BOLTEN MELLOM AUTOPILOTARMEN OG RORET RØKET.ORDNET PROVISORISK M TAU.STYRER MANUELT.BESØK AV HVALER. 26.11 KL 12.00UTC POS 15 41N 43 33W FEIRER AT VI ER HALVEIS. BARE 1060 NM IGJEN TIL ANTIGUA:-) STRELENDE SOL SOM VANLIG. 25.11 KL 12.00 UTC 16 01.6N 41 04.1W 'RANGER' EN 42 METER(!) J-BOAT PASSERER AKTENFOR. HYGGELIG PRAT PE VHF. 24.11 KL 12.00 UTC POS 16 05.4N 38 37.3W HARALD ER BLITT EN AV MANNSKAPET OG HAR TRUKKET I MANNSKAPSANTREKKET: UNDERBUKSA. POS 16 39.1N 28 57.1W 13 KNOP VIND OG HEIST GENNAKEREN. GJØR 7 KNOP OG ALT BRA. 16 35.7N 27 25.3W 5 KN VIND OG DRIVER MED STRØMMEN.TROR VI SE STOR HAI. Vi er fremme på øya Sal en gang i løpet av morgendagen. Det er lite vind men mye sjø og bølger. Kjetil ble truffet av flyvefisk i armen på nattevakt. Flyvevisken kommer i svermer men de fleste stanger i båten. Vi har det strålende. Vi har sett hval og Arthur har fått fisk, en stor dorado. Arthur er en venn av Lars Henrik som er med på seilasen fra Kanariøyene til Kapp Verde. Vi har fått fisk og har sett 3 fugler, 2 fugler mer enn vanlig. En begivenhetsrik dag! by the things you did not do than by the things you did do. So, throw off the bowlines. Sail away from the safe harbor. Catch the trade winds in your sails. Explore. Dream. Discover. Royalwings har kommet hjem. På bryggen ventet stolte foreldre som hadde arrangert overraskelsesfest! Royalwings has finally arrived Crosshaven, just outside Cork in south Ireland. 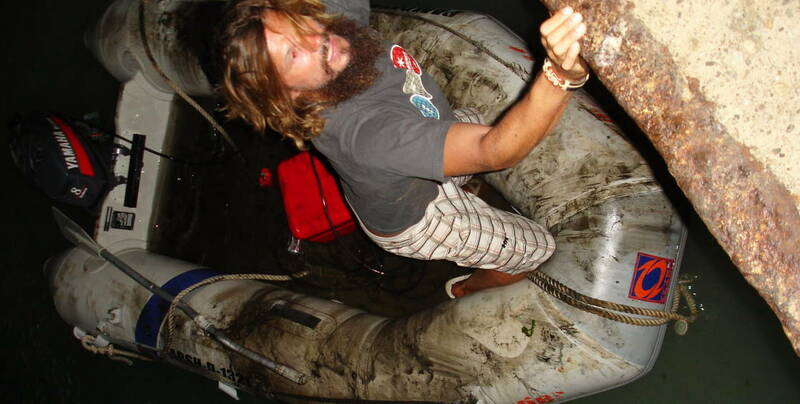 It has been a very rough crossing, with strong winds, high sea, fog and rain most of the time. And we survived a severe storm! We are glad to be alive and we look forward to coming home! Hent harpunen gutter, nå blir det hvalbiff!!! - Oj der er det en! Ser du’n? Rett foran, litt på babord side. Der er'n igjen! Lars Henrik hopper opp bak roret og roper opprømt. Foran oss står sputen himmelhøyt til værs. Hval! Johooooo!!!! Innseilingen til Halifax var som å komme til Norge. Det luktet barskog. Og norsk sommervær. Vi forlot Newport i solnedgangen. Varmt og deilig. Så kom tåken. Null sikt. Regn. Og vanntemperaturen sank fra behagelige 18 til utrolige 3 grader. Og bak oss kommer stormen Cristobal, på vei rett mot oss. Skulle vi klare å rekke frem til Halifax i tide? Ja, saa satt vi der igjen da!! Ved avreise fra dieselkaia i Newport var det duket for nye problemer med elektronikken ombord! Frank møtte oss på Aruba og ble med på seilasen til Jamaica. Det ble to uker med blant annet jet set liv i Aruba, herlig langseilas til Jamaica, møte med rastafarikultur, "innføringskurs" i wining (karibisk dans), jungeltur og hopping i fantastiske fossefall. Her er Franks egen historie! Vi har funnet paradiset: Los Roques! Det er uten tvil det mest fantastiske stedet vi har vært i hele karibia. Og her fikk vi besøk av Kari og Inger Lise som skulle lære oss å kite! Her kommer den usminkede sannhet fra en mors erfaring fra et toukers cruice på Royalwings. Bilder med kommentarer er det eneste redaktørene har lagt til reisebrevet. Og her er det maaaange bilder! Solen har akkurat stupt ned i vannet og malt himmelen rød og gul. Nå blinker tusener på tusener med stjerner på himmelhvelvingen, som om de våker over oss der vi smyger oss frem i natten. Eneste lyden er vinden som blafrer forsiktig mot seilene, og sjøen som viker vei for baugen som holder stø kurs mot vest. Morilden gnistrer i vannet. Vi er på en seilbåt midt i Atlanterhavet, på vei til Karibia. Så kommer delfinene. Det er slike øyeblikk man lever for. Vi er blitt meget glad i Spania! Så etter et litt for langt opphold i La Coruna bestemte vi oss for at vi måtte ta et skippertak og komme oss godt sørover. Vi skulle hoppe over Portugal og gå direkte til Cadiz i Sør-Spania. Så var vi på tur sørover mot varmere strøk. Selv om været ikke var på topp, så var humøret på topp! Vi var på tur sørover og alt gikk på skinner! Etter 14 lange og intense dager i Les Sables d’Olonne. er vi overmodne etter å komme i gang med vår reise og sett kurs sørover mot sørligere breddegrader. For nå er sommeren over i Les Sables. Vi setter kurs mot La Rochelle, kun 30-40 nautiske sør for Le Sables. You can call us anytime (we have watch 24/7) on our satellite phone at +881 641 463 956. We do not pay to receive calls, but it costs approx NOK 30 (approx USD 5) per min to call from a fixed line in Norway. You can also send a message to the sat tel (free to send and receive). Click HERE to send a message (type the phone no without the plus sign, and remember to type your name). You can monitor the weather while we are crossing the Atlantic using our Weather page. We download weather forecast (grib file) everyday via the satellite phone and so can you. using the Internet. Click HERE to download the weather program we use for downloading weather data. (It's free to use, but you need to register online).